recommended for: For fans of Rainbow Rowell, Katie McGarry, Sandy Hall, and Jennifer E. Smith. I greatly admire Adi, who is delightfully charming in person, and so I was excited to read him for the first time. Never Always Sometimes turned out to be a story as adorable as its author. Meet Dave and Julia, best friends for years. In middle school, they wrote a list of things they'd never do, cliches to avoid. Now in their senior year of high school, they're determined to break them all--except Dave already has, by being in love with Julia for years. Their journey through the Nevers was wacky and cute, despite a few creepy exceptions. I also loved that Adi threw a wrench into the works with Gretchen, a sweet girl with an eye for Dave. Even while succumbing to some romance cliches, Adi subverts others in a way that was delightfully surprising. 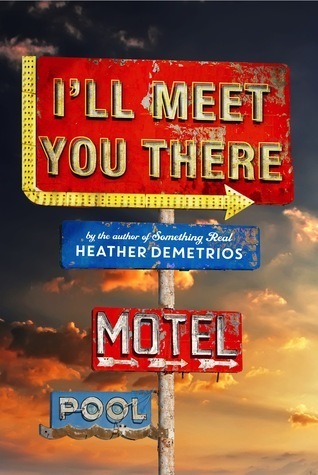 Despite a too-sweet ending and a few uncomfortable bits, Never Always Sometimes was an enjoyable, great beach read. 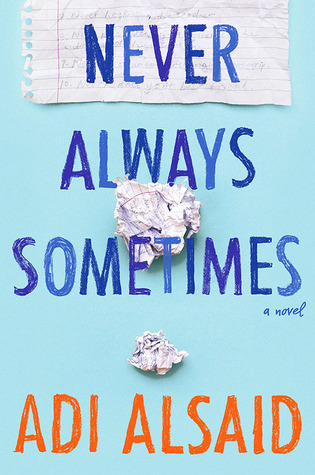 Never Always Sometimes is a solid, charming young adult contemporary romance. While the best-friends-falling-for-each-other set-up isn't new, Adi gives it a special spin. Back in middle school, Dave and Julia made a pact and a list: all the high school cliches they would never do, from running for prom king to dying your hair a crazy color. Or dating your best friend. Then, in the wake of graduation, they decide to do every single one. With this set-up, the novel becomes about more than two friends falling for each other. Instead, through their wacky adventures, we get to see Dave and Julia's friendship and its changing dynamics. We get to have fun with them, and we get to watch as their feelings deepen unexpectedly--and Julia's downward spiral when she realizes that she might lose Dave to sweet Gretchen. The story isn't especially different from other contemporaries I've read, but it's fun and ridiculously cute. I loved most of Dave and Julia's crazy antics. They dye their hair and end up accidentally dying the cat. They drum up a crazy campaign for Dave to be prom king. They build the ultimate tree house hangout. Adi's clear, authentic narration brings their story alive. I connected with Dave earliest. He was a little quieter, a little more hesitant. He'd nursed a crush on Julia for years, too afraid to ruin their friendship. I felt so many feels when Dave began bonding with Gretchen and feeling confident about himself. Julia was a harder sell. She's reckless, wild, and frequently callous. It wasn't until midday through, when her soft side began to sneak through, that I really felt for her and began to understand her demons and motivations. and just a few hitches. What really knocked this story down a few pegs for me was twofold. First of all, one of the Nevers is "Never hook up with a teacher." Julia makes it her personal mission to seduce her math teacher. At first it starts as relatively innocent, attempting to bump into him at a restaurant, admiring his tie. But she ups the ante to somewhat implausible levels. Much of her behavior could get her a stalking charge. I hated how uncomfortable she made her poor teacher feel, and how she didn't quite feel guilty enough after. But the biggest turn-off was the cheating. Someone cheated on someone, and I just find it really difficult to sympathize or root for any character after that, especially when it feels like the crime is just swept under the rug in favor of a happy ending. Never Always Sometimes is a cute contemporary romance that celebrates friendship and finding the right person, even if they're someone you never expected. will i read this author again? Yeah, I'd like to check out Let's Get Lost.